Whatever you call it, libraries, schools, warehouses and commercial spaces are pooping up everywhere. Here's what I've learned from making these creative spaces for kids and adults, including the products that make it come to life. A sewing machine is the other rapid prototyping tool that never goes out of style. I've used this simple sewing machine for years and it's never let me down. It's also easy to teach others how to use! 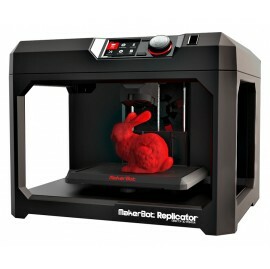 No matter how big or small your maker space is, a 3D printer allows for rapid prototyping and design.I have two of these MakerBot Replicators, but one is more than enough. You'll also need a lot of filament in different colors. I suggest buying the 10-pack and replacing colors when they run out. TinkerCAD, Beetle Blocks or Thingiverse are all great ways to make something to print on the 3D printer. A vinyl cutter is another great tool to have in a maker space. You can buy vinyl that will adhere to clothing. I like the Silhouette Cameo because it sits on the desktop and is easy to use, but there are also standing ones like the one below. Depends on how much you plan on using it. Inkscape is what I've used for designing things for the vinyl cutter, but I ​know there are other more kid friendly programs out there. A peg board is a great way to store scissors, fabric, yarn, screw drivers, duck tape, etc without taking up floor space. I've made the mistake of buying the cheaper wooden pegboards and students end up breaking the holes pulling things off the wall, a metal peg board is the way to go. I lined a whole wall with these storage containers. They don't take up much room and they allow for everything to be displayed so students (and teachers) don't have to ask "where is..." quite so much. You can also remove the bins easily and take them to your work station. To fill these bins, I go to places like ​RAFT or Scrap to buy bulk items. Donations are also great, but make sure you get enough quantity to justify the effort - a small bag of loose buttons aren't going to cut it. Ozobots are light sensor, programmable robots. Students 3rd - 5th grade LOVE them and you can use them again and again for different projects or objectives. Teach programming, use as "people" in city models, or just make maps for them to follow. I got two dozen for the lab and used this USB multi-port to power them. These materials are great to have on hand. Alligator clip jumpers make it easy to use and reuse and the motors and fans can be made into tons of projects, from solar cars to pinwheel hats. I stocked the Design Lab with some kits that can inspire the uninspired or fill a rainy day recess. GoldieBlox and Snap Circuits are two great ones to have on hand. Fans come in handy and not just on a hot day. 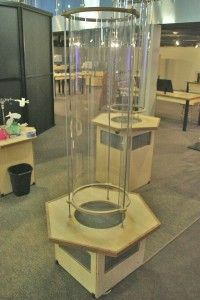 From making a wind tunnels, to an airplane merry-go-round, fans can be lots of fun and useful too.